This week’s article will be talking about the topic of various ways of counterstriking against an attack. Different masters and traditions handle this differently, depending on their core tactics and views on what distances and timing to use as the basis for the general fighting. Some even mix different solutions in varying proportions, combining different and sometimes disparate styles into their own personal style, with Joachim Meyer being a prime example of this. – Meaning you strike in direct opposition to the incoming strike, much like e.g. George Silver and Joachim Meyer sometimes advises us to use kinetic power rather than leverage, e.g. with the Entrüsthauw or Rüsthauw and the Dempffhauw – cuts that are made with all sword types in Meyer’s treatise. – Meaning you cut against an incoming cut at an angle, thus weakening the opponent’s cut, for e.g. with a Zornhauw against a Scheitel/Oberhauw, or a Scheitel/Oberhauw against a Zornhauw. The use of most Maisterhäuwe (Master Cut) and the Versetzen (Displacing Cut) is designed around this. – Meaning you cut in a way that instantly puts the opponent’s weak part (red/orange below) on your strong part (green/blue or the cross). For example, against a Zornhauw you can cut an Unterhauw or a Zwerchhauw ending up in Ochs/Hengen. There really are no other ways of counterstriking with blade contact when the opponent’s strike actually risks hitting you. With that said, you can also step back or aside and void the opponent’s attack and counterstrike in Nachreissen, perhaps even using a weak bind to fool the opponent with a Schnappen (Snapping). But, if you actually risk being hit and can’t or won’t step, then one of the three methods above have to be used. Looking more closely at this method, you can use it in two ways, either properly or deceptively. The first means to actually parry the strike with an opposing counterstrike, the second means that you give the impression that you will do so, but instead feint, for instance by parrying and then making your next strike as a Schnappen, by using the force from the opponent’s strike to power and speed up your counterstrike, letting your strike fly around full circle to the other high opening. Using it properly, and not as a feint, means you will have to use equal or more power, or else your parry will be weak and possible to cut through. Slipping back a bit, and moving the head out of the way is also a good idea as you are striking after your opponent, meaning you will be behind him/her in time. The first is when you first put off your opponent’s strike or send it away with a cut, and then rush at his body with a cut, having taken his defence. … you need to know that the High Cut suppresses all other cuts downward from above, namely the Wrath, Middle or Horizontal, and Low Cut, in this manner: spring out from his cut, and at the same time cut strongly at his cut as it comes in, so that if you hit correctly, you weaken his weapon so much that you can well cut the second one at his body before he fully recovers. This method is also commonly used with single hand swords, creating a pattern of strike-parry, strike-parry. This method should receive more focus even in our longsword fencing, I believe. Two-handed swords however, allow for other methods that can be used with reasonable control and safety. Which brings us to the next method. 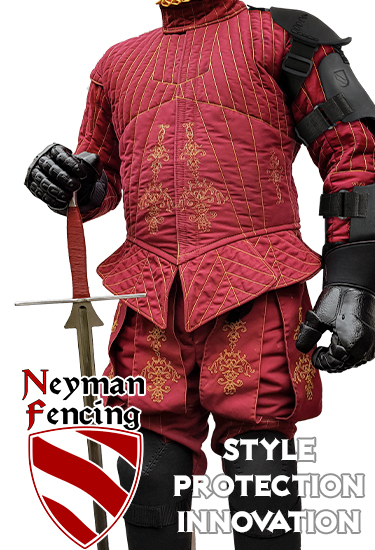 The next method is possibly the most commonly used in the “German” longsword fencing. Here you countercut at an angle, both aligning the blade and the edge in various ways. This protects not only you, but also your blade against the most of the impact as it is not done in direct opposition to the incoming cut. Almost all of the Maisterhäuwe are designed around this concept of a capacity for parrying and hitting simultanously and they exploit the same mechanical principles. A Krumphauw, a Zornhauw, an Oberhauw etc can all be done in a way that means that they cut through the opponent’s strike and hit, depending on how you combine your choice of strike with that of your opponent, and depending on how you time and angle your strikes. So, the related cuts of Zwerchhauw, the Schielhauw, the Glützhauw and the Kronhauw are the best ones for this purpose, in Meyer’s opinion. And remember how Meyer tells us that half the fighting should be done with the Zwerch? If this is true even for the older fencing before Meyer is hard to tell, but in Meyer’s case his advise is very clear and bears some careful consideration how we should apply this in our fighting. It should also be noted that some counterstrikes can begin like a displacing cut and then transform into a cut that uses leverage more, as either of you move closer. Things are not always, and excuse the pun, clear-cut. This topic I believe is a commonly misunderstood one. Oftentimes it is claimed that striking with the point or the centre-of-percussion (c.o.p.) provides the hardest strikes, especially when you strike with the hands close together, per the advise given in the Hs.3227a treatise. However, this strongly relates to the blade type and the material you cut at. Most of our longswords are not forward-heavy and we see the same in many of the treatises, even early on like in Talhoffer and others. This means that striking hard with the point or the c.o.p. works well against soft targets, but not at hard ones. The implication of this is that such cuts work well against a neck or hands/wrists etc, but for a proper head cut you need to cut further in on the blade, closer to the middle, somewhere in the orange area of the blade in the image above. One of the best examples of this is Paul Hektor Mair who consistently shows blod spurts with such head cuts in his treatise Opus Amplissimum de Arte Athletica (Cod.icon. 393) of ca 1550. These powerful cuts naturally require fighting at closer distance, which is also why we oftentimes see them used as the second cut, the Nachschlag, as the attacker moves closer after having been parried. This kinetic power can of course also be used when deflecting or supressing the opponent’s cuts with the Maisterhäuwe as in the first two methods described in this article. That’s it for this time. I hope you enjoyed reading this chapter and found some of it useful. Thanks to Dr. Jeffrey Forgeng and David Lindholm for providing us with great translations of these sources! Next time we will begin to cover the topic of Types of cuts. Very nice article Roger! Keep up the good work! nice article, do you know if there is a relation between the fighting distance and the type of parry (Opposing kinetic power, Deflecting power or Advantage through leverage)? Is there any advise of one of the masters that tells you which type of parry is best suited for which distance (zufechten, krieg)?